Good evening! As you may well know, I am sharing my family’s favorite holiday side dishes with you this week. Tonight’s recipe was and is one of my favorites when my mom’s family gets together. 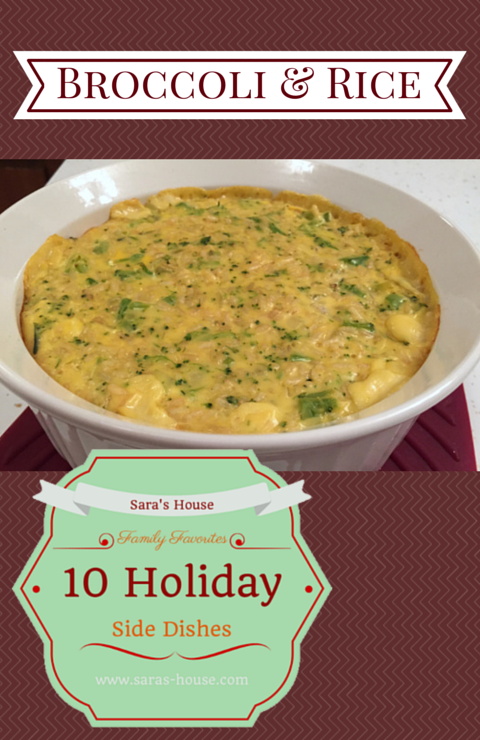 My Aunt Sara usually brings this side dish to our family gatherings. This is actually my first time making it at home, but my boys love it too, so I’m sure it won’t be the last! It’s broccoli and rice casserole and goes well with any type of meat dish that you are serving. So this would be perfect to pair with your turkey this coming Thanksgiving! Below is my recipe. Enjoy! Also this week I’ve been talking about the Thankful 4 Ag campaign. I am teaming up with Bayer CropScience who is partnering with Feeding America to help bring awareness and raise money for people and families who struggle with hunger. This time of the year is really special for families when they get together and celebrate the holidays, a lot of the times these gatherings are centered around food. But 1 out of every 6 people in America are facing hunger issues. So to help with this, every time someone goes to the Thankful 4 Ag website and creates a digital meal with four of his or her favorite Thanksgiving dishes, Bayer will donate 10 meals to Feeding America. Today I also want to share a video that my friend Kristin from Local Farm Mom put together to share her thoughts and a great recipe to help bring awareness to the #thankful4ag campaign! Prepare the Minute Rice according to the directions on the box. Melt butter and saute the onion until tender. Add the broccoli and cook until thawed and hot. Add the cheese and heat until it's melted. Mix the cooked rice into the broccoli and cheese. Pour into a casserole dish and bake at 350 degrees for about 30-35 minutes.